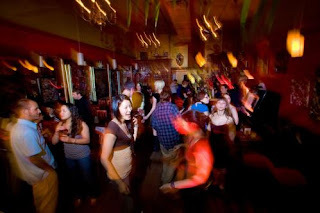 I had a blast last night DJing at the Mambo Beat Club at ZuZu's in Central Square. The crowd was great going to the dancefloor for all the 60s beat, soul, and boogaloo Ari and I could serve them up. I'd like to thank for Ari for a great time. The Mambo Beat Club has unofficially released a compilation album featuring tracks selected by many of the nights luminary guest DJs including: Brother Cleve, DJ Vinny, Ty Jesso, Professor Z, and Ari himself, the Beat Train. For more info check out http://www.myspace.com/cheapthrillsagogo . You may be able to snag a copy for yourself if you ask nicely. Here is a trailer for a new documentary coming out about digging for rare records in Africa, Ghana specifically. Filmed by Leigh Iacobucci, who followed DJ Frank of Soul Explosion around on his travels in Ghana. Highlights that are making us salivate with anticipation are: Gilles Gnonnas performing his fathers' Afrobeat bomb "okpo videa bassouo" as well as interviews with El Rego, Gustave Bentho (Poly Rythmo) and Danialouh Sagbohan. You can beat we'll be the first to post when this film wil released. I know this song and video has been out for a while now but I just thought I'd share it with everyone since it is so great. I love the subtly in performance and in the video. The song was recently remixed by Mr. Scruff for the dancefloor as well. As we promosed we are back with a new night of live music and DJs. The premiere will be on May 25th at Church (formerly the Linwood) at 69 Kilmarnock St. in the Fenway. 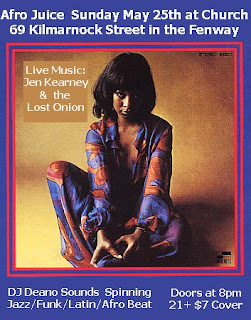 I'm be spinning Jazz/Funk/Soul/Afrobeat and there will be a special live performance by Jen Kearney and the Lost Onion. Jen Kearney is a great band with a soulful vocalist and driven by latin percussion. Check out there website for audio samples. These tracks are posted for educational purposes only, for people to listen to. Many of the tracks are out of print and these that you can buy we link to the proper retailer. Tracks are only made available for a limited time and we do not keep an archive of previously posted tracks. Our main goal through this site is to educate those that are interested about some great rare music which hopefully in turn will create more awareness and appreciation for these artists. This will encourage everyone to go out and buy music by the artists they feel merit their hard-earned cash. We will make every effort to post where you can purchase this music. If you own the copyright to one of these tunes and do not want anyone to hear it, let us know and we will remove it immediately. Thanks for your support.